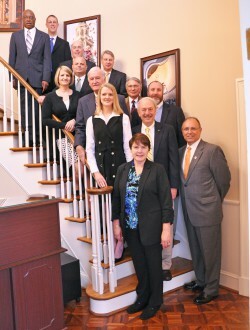 MILLIGAN COLLEGE, Tenn. (April 7, 2015) — Today, Milligan College recognized 13 local leaders who have demonstrated servant leadership in their careers and community at the college’s annual Leaders in Christian Service program in Milligan’s Mary B. Martin Auditorium in Seeger Memorial Chapel. David Beamer, father of 9/11 hero Todd Beamer, delivered the keynote address. Mary Ann Blessing, of Bristol, Tennessee, is the director of Kingsway Charities. She attends Highlands Fellowship. Joe Carr, of Jonesborough, Tennessee, is an executive vice president at the Bank of Tennessee. He attends Fairview United Methodist Church. Jeff Clements, of Johnson City, is a mechanical engineer at Eastman Chemical Company. He attends Munsey Memorial United Methodist Church. Kyle Colvett, of Johnson City, is a physician at Mountain States Health Alliance. He attends Family Fellowship Church. Stephen and Trida LaHair, of Kingsport, Tennessee, are the owners of Chef’s Pizzeria and Southern Barbeque. He attends First Baptist of Kingsport. Ed Gibbons, of Jonesborough, Tennessee, is the owner of Watauga Insurance. He attends Central Baptist Church of Johnson City. Rebecca Henderson, of Johnson City, is a consultant at Strategic Priorities Consulting. She attends First Christian Church of Johnson City. Bill Lizzio, of Johnson City, is the owner of Lizzio Development Company. He attends First Christian Church of Johnson City. Tim Morganstern, of Jonesborough, Tennessee, is a chiropractor at the Jonesborough Chiropractic Clinic. He attends Jonesborough United Methodist Church. Charles Nitschke, of Kingsport, Tennessee, is the retired director of business organization at Eastman. He attends Holy Trinity Lutheran Church of Kingsport. Kathy Sanders, of Kingsport, Tennessee, is the owner of Tri-Cities Center for Cosmetic Dentistry. She attends Colonial Heights Baptist Church in Kingsport. Thurman Walters, of Johnson City, is a healthcare technician at James H. Quillen Veterans Administration Medical Center. He attends Friendship Baptist Church. For more information, contact Milligan’s Institute for Servant Leadership at 423.461.8316 or visit www.milligan.edu/institute-for-servant-leadership. Posted by Stephen Woodward on April 7, 2015.